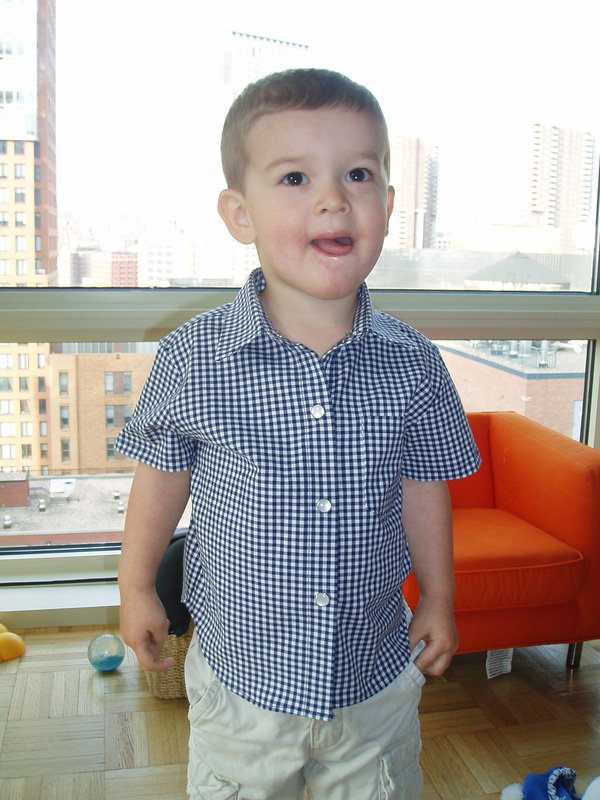 Pattern Description: Toddlers’ shirts have collar with collar stand, yoke, front placket with button closure, and shirt-tail hemline. View A has long sleeves with buttoned cuffs and breast pocket. View B has short sleeves and breast pocket. View C has western-style yokes, long sleeves with buttoned cuffs, and front pockets with buttoned flaps. I made view B. 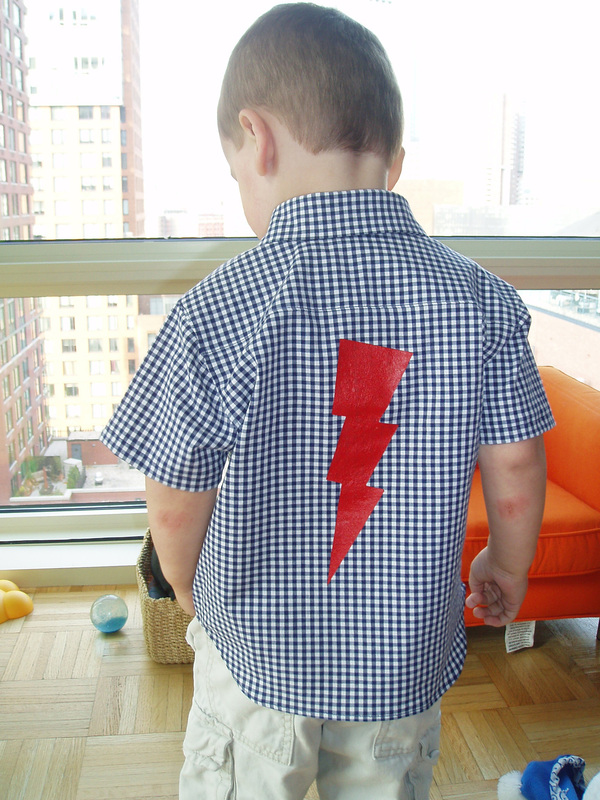 Pattern Sizing: T1-T4 — I made a T2 for my nephew Thor; he just turned two. It’s a little big on him, but I think that’s fine for this kind of shirt and he’s got room to grow. Were the instructions easy to follow? The instructions were very easy to follow. LIKES: I thought the collar/stand instructions were great and made for a great looking collar. I am really proud of my first collar and stand!!! my FIRST collar with stand! Even David Coffin thought so. Really! We’re FB friends and when I posted a picture of the collar and stand he commented, “Nice collar.” I was blown away! In my shirtmaking research I did read David Coffin’s book on shirtmaking from cover to cover. I thought it was fantastic and it definitely helped me with this project. The Kwik Sew method for making a clean finish on the yoke was also great. DISLIKES: I didn’t like the tiny seam allowances which did not allow for flat felled seams at all. 1/4 inch SA’s??? You can’t even serge them to finish them off. I accidentally serged off part of one of the sleeves. It was minor and I was able to fix it, but it could have been a disaster. I ended up overcasting with my sewing machine to patch some sections. 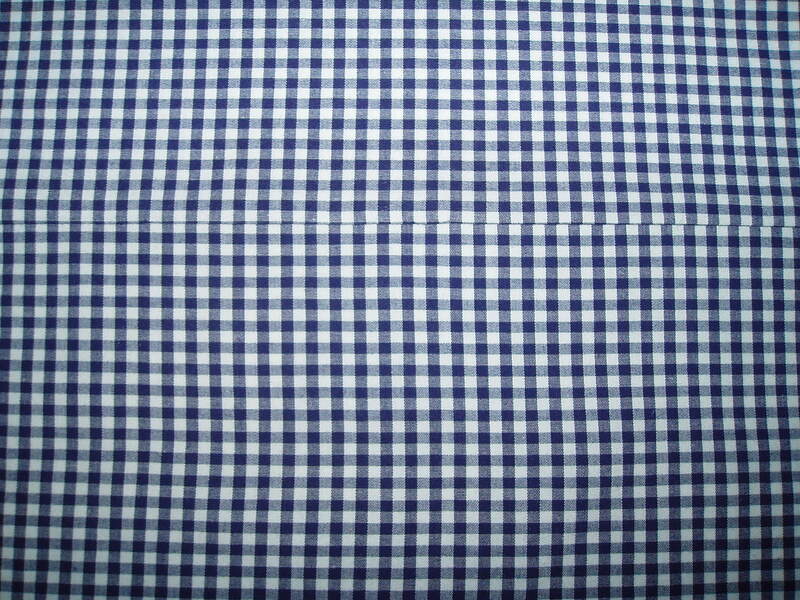 Fabric Used: I bought what I thought was a plain cotton gingham fabric, but when I got it home, I noticed it had some stretch. 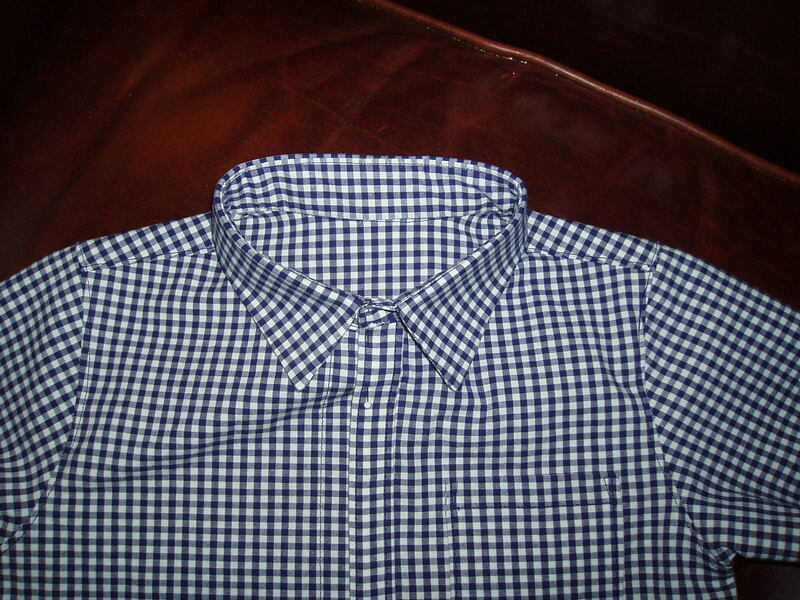 I just assumed it was 100% cotton because why would anyone add lycra to gingham shirting? I just don’t understand it. However, it didn’t really affect anything with the making of the shirt. Because of the regularity of the print/weave of the fabric, I cut all the pattern pieces in a single layer to match up the print as much as possible. 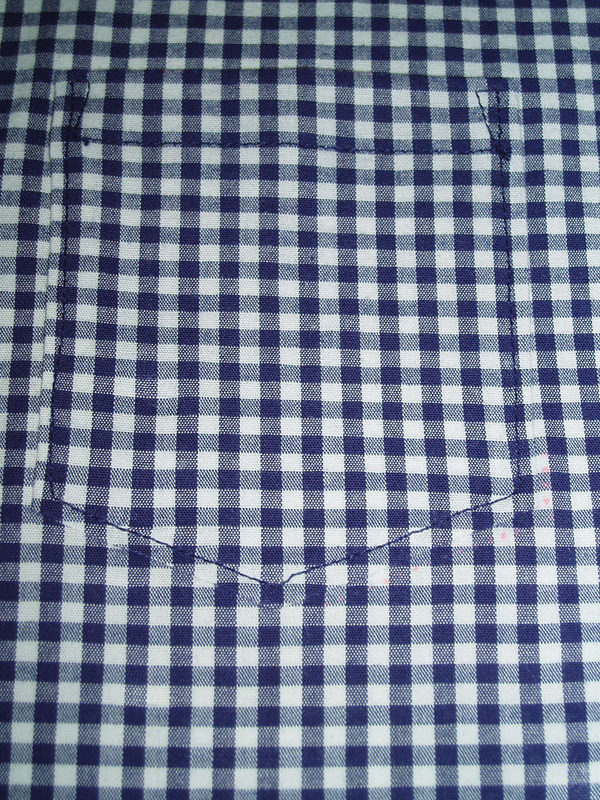 While they were cut precisely to match, it was a little difficult to maintain the matching of the gingham at the machine. I think it will take much more practice and maybe the use of my walking foot, but I’ll get there. This was my first time really trying to match such a pattern. Pattern alterations or any design changes you made: I didn’t make any real alterations, but I did change construction order and used some different techniques. I did not interface the pocket as I didn’t think it was necessary. The instructions would have you hem the shirt before you sew the side seams, but I think that’s crazy. I waited until after I had sewn them. I guess I’m no longer a beginner now if I am disagreeing with pattern instructions! On the other hand, the instructions also have you sew up the sleeves before you hem them, but it’s really hard to hem tiny little sleeves. I didn’t think of this before I sewed them up, so I was forced to hem them after they were sewn. But if I had sewn up the T1 size, I don’t think I could have hemmed the sleeves on the machine; I would have had to sew them by hand. Another change I made to the pattern was to use pearl snaps instead of buttons. I just thought it was a neater look and more child friendly. I loved it. 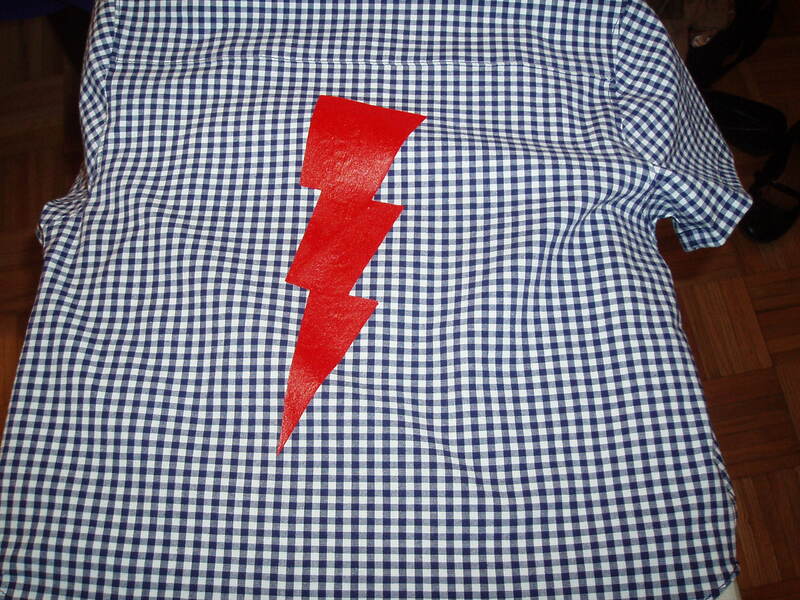 And an embellishment I added was to use freezer paper stencil (tutorial here) to create a red thunderbolt on the back of the shirt for a more urban feel. Thor’s name means God of Thunder, so it was very a propos and he loved it. Would you sew it again? Would you recommend it to others? I will definitely make it again, but next time, I will add more to the seam allowances so I can make flat felled seams. Why not? You’ve already gone to the trouble to make a real collar and stand. Why wouldn’t you also want flat felled seams as well? Also next time, I will only interface half the placket as I felt it was too stiff after all the layers are sewn together. It could have been that my interfacing was too stiff, but I still think halving the interfacing would be better. I would definitely recommend this to anyone, even beginners, as long as they take their time and really understand the directions. Conclusion: I love this pattern. 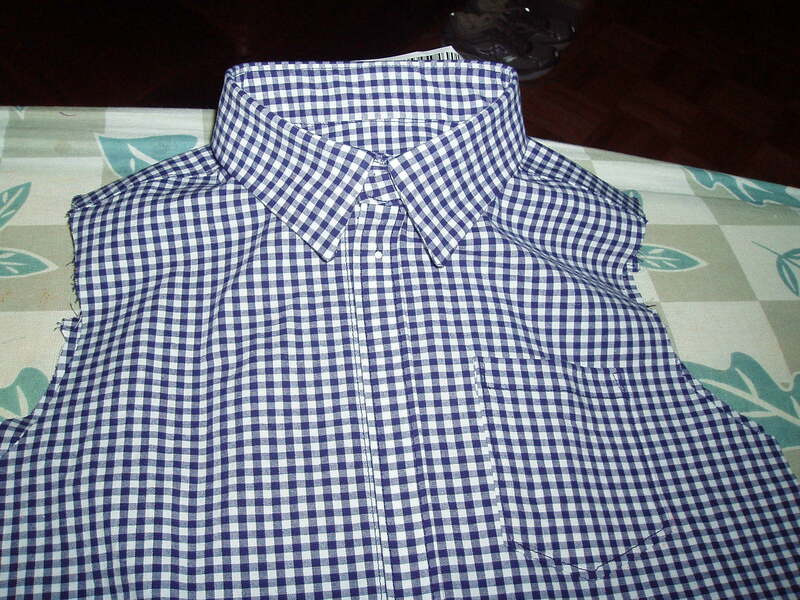 I think it makes a great and professional looking shirt due to the great collar/stand and yoke instructions. In other sewing news, I just muslined the bodice for Vogue’s DVF wrap dress knockoff, 8379. I will start cutting out the real fabric tomorrow. Wish me luck please. Wow, either I am getting better at this sewing thing or this is just a speedy project. After all it is a teeny tiny little shirt. Did I mention that it was small too? Tonight I assembled the collar and stand. Then I attached the sleeves and sewed up the side seams. Thank you for all your kind comments and suggestions on my last post about the matching. I actually feel a lot better about my matching today. Sometimes you just need some time to get some perspective. Right? I still have to have to serge the side seam SA’s, make the buttonholes, attach the buttons, and hem the sleeves and bottom of the shirt. I actually feel pretty confident that I can do all that Friday night. Am I nuts??? check out that pattern matching with the pocket! I do have an idea to add an embellishment to the shirt, but it’s a secret as I think my sister reads my blog sometimes. If she doesn’t she’s in big trouble. Hahahaha! P.S. Carolyn pointed out to me that I neglected to mention the store that was having a great sale in NYC. It’s P&S Fabrics on Broadway below Canal and above Worth. I’m a dork. What can I say? Iron your shirting fabric, don’t just press it. Stretch it out in the same direction as the selvedges. 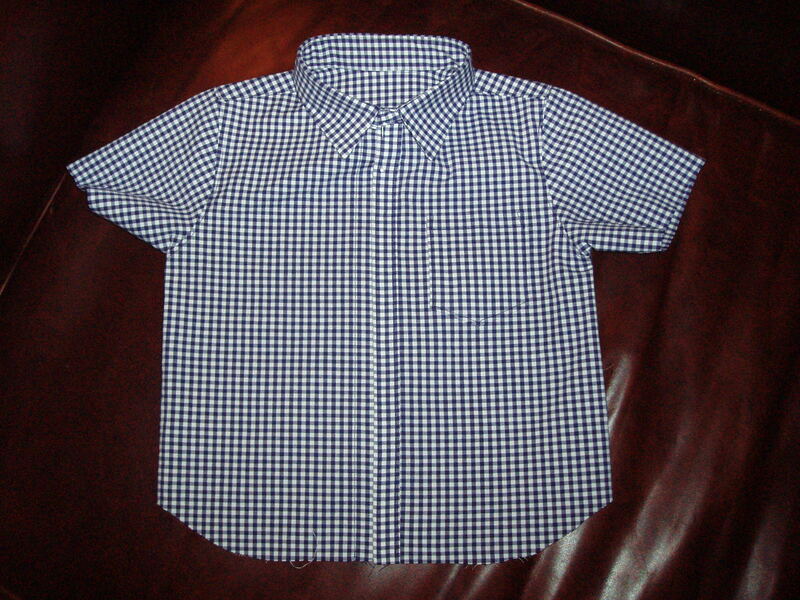 Use sew in interfacing not fusible since you wash shirts often. Use a flat fell foot for superior flat fell seams. Insert arms flat and then sew side seams. 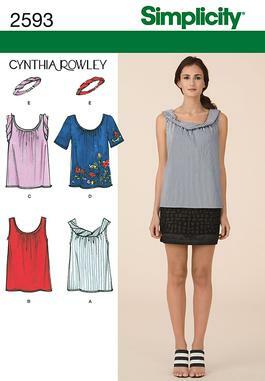 Match the lightest thread color present in your shirting for your thread. The first point is something Thea had already mentioned to me when I had problems with my Alhambra clover print fabric. The sewing the arms flat first thing was a surprise to me as well as the match the lightest thread color. And actually I disagreed with that last point for my specific fabric print. I, unfortunately, do not own a flat fell foot as it did not come with my machine, but will consider getting one for the future. 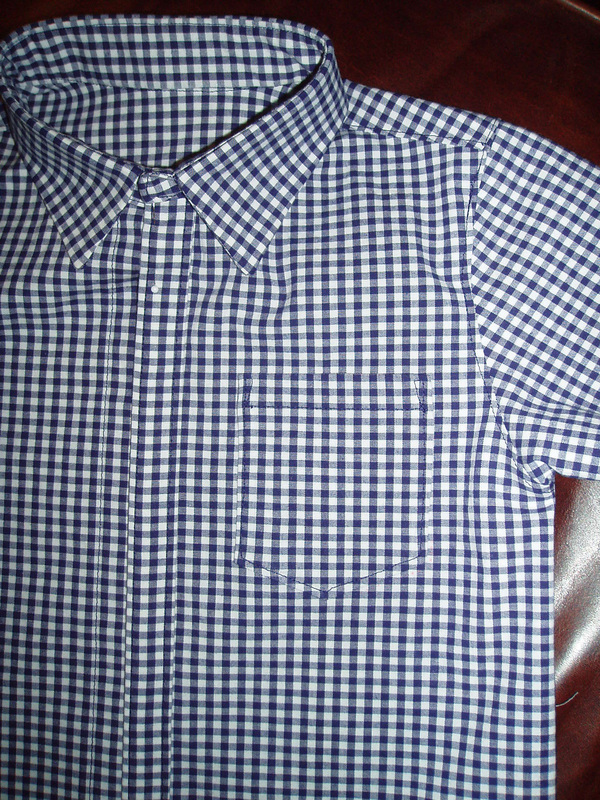 But fortunately, my little boy’s shirt pattern does not require flat felled seams as the seam allowances are only a 1/4 inch, much too small for a flat fell seam finish. 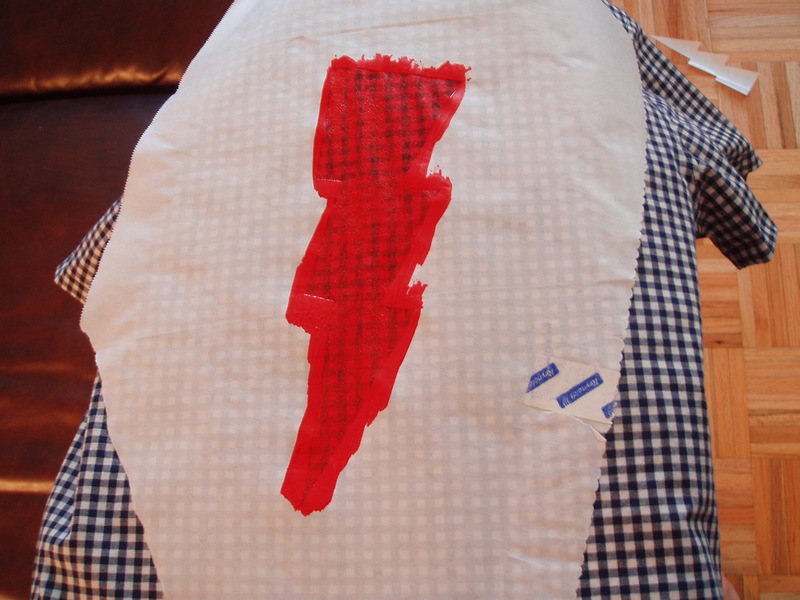 I had my sewing lesson with Thea last night and we started work on the shirt. When I cut out the fabric, I cut in a single layer so as to match the print as much as possible. 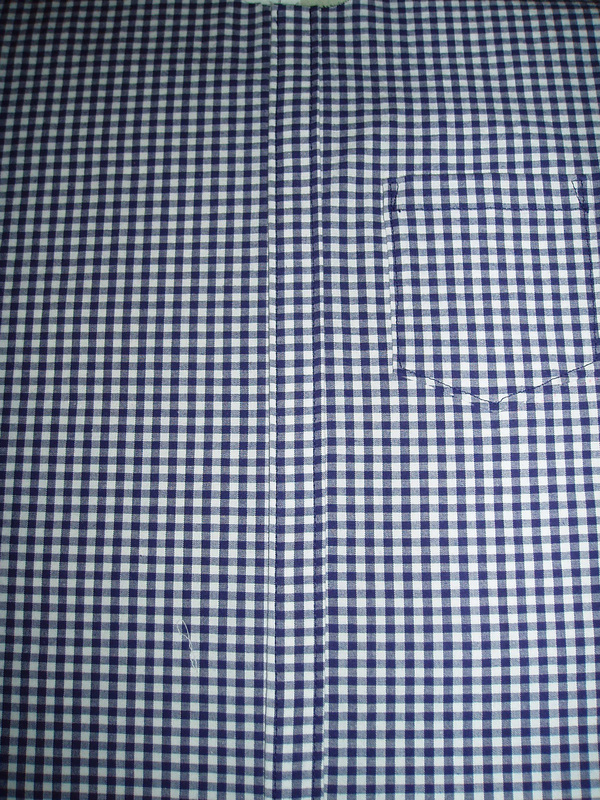 I am using a check fabric, or is it gingham? I can’t see what the difference is between the two. But despite my careful cutting, I still did not get a perfect match. I’m kind of bummed about that. The feed dogs just didn’t want me to match I guess. Not sure what else I can do to counteract this, except to whip out the walking foot. Any suggestions? I pinned the heck out of it. As for thread choice, I went with a navy thread even though David Coffin suggests white when white is present. I just thought it blended better. Here’s my test swatch. So far I have interfaced the parts that needed interfacing, the collar and stand, and the button hole placket. I used Pam Erny’s interfacing. I really like her interfacing but can’t speak to competitor stuff as hers is the only kind I have ever used. 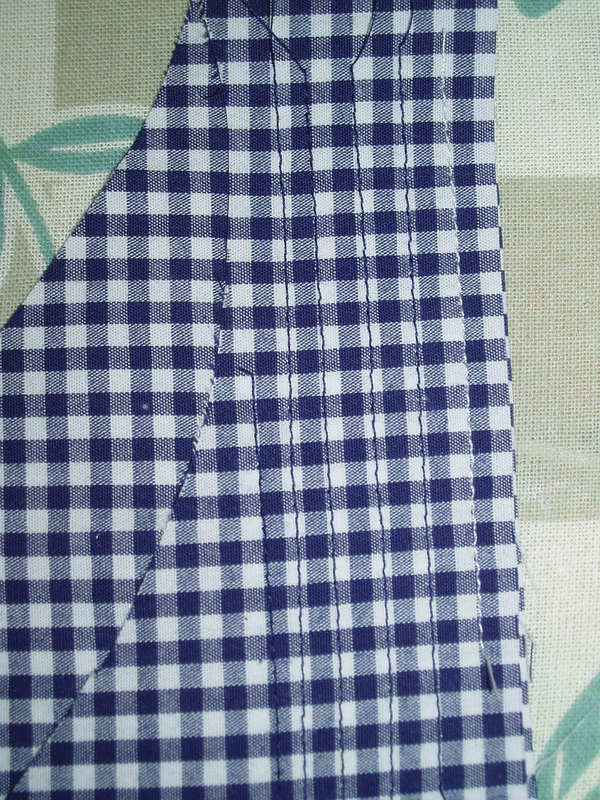 For the placket, I probably should have cut the interfacing in half because you double the placket over itself, thereby doubling the interfacing and it became too stiff. Live and learn. I opted not to interface the pocket and am pretty proud of my placement. It’s perfectly matching on one side, and just a little off on the other. The topstitching isn’t too bad either, but again, not perfect. That’s where I left off last night. I have to attach the yoke to the fronts now. Working on that tonight. Wish me luck!